We absolutely love to make snacks that the kids can make themselves and these Acorn Chocolate Peanut Butter Acorn Cookies are perfect for little and big kids alike! The kids really enjoy making these snacks for their friends and we ended up having a huge cookie fest up and down the block! All of the neighbors got some and said they were fabulous!! Scoop your peanut butter into a Ziplock baggie. You can either use regular size or the snack size works just as well and is actually easier for the little ones to handle. Squeeze a small drop of peanut butter onto the bottom of the Nilla Wafer Mini Cookies. Place the Dark Chocolate Kiss and press firmly using the peanut butter to “glue” it on. Place a small drop of peanut butter onto the top of the Nilla Wafer and “glue” your peanut butter chip to the top. Now you have your perfect little Chocolate Peanut Butter Acorn Cookies!! Aren’t they cute!! Fall is the perfect time of year to do fall crafts!! We also enjoy a lot of walks and outdoor time in the fall. It is my favorite time of the year and the kiddos can sure tell! These are a great fall snack after a evening walk. Grab up the kiddos and do a little gathering of some bright colored fall leaves and take them home and do some crayon rubbings while you are enjoying you chocolate peanut butter acorn cookies and really get the most out of fall!! 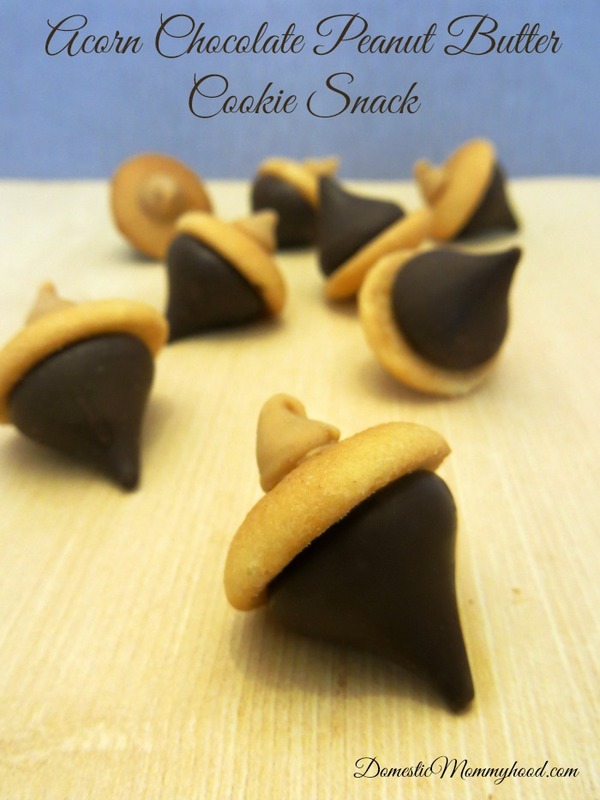 Who do you plan on making these awesome acorn chocolate peanut butter acorn cookie snacks with?? on my fall to do list! They are adorable! Your Acorn Chocolate Peanut Butter Acorn Cookies are just adorable and would be delicious! Hope you are having a fantastic week and thanks so much for sharing your awesome post with Full Plate Thursday. What a clever idea for a kids party! Thank you, for linking up with Merry Mondays.